Codesign #1 – How our core values define the way we design spaces? User-centered design, an approach of creating innovative products and services with strong user participation, has been widely adopted by the startup community in recent years. Thousands of companies worldwide have been putting tremendous effort to build products people love. The idea of user participation in the real estate industry however is new. Regulations, financial planning and construction efficiency make it hard to adopt innovation. At Urban Campus we believe this must change. We challenge ourselves to create an environment where our members feel and perform at their best – both at work and in their leisure time. We design and develop spaces not just for the people, but together with them. In the last months we’ve been working hard to welcome new members in our first shared living community in Madrid – the first rooms will be available in Madrid Gaztambide (Chamberi) by the end of June! ? To make this happen, we’ve reached out to people interested in our initiative and gathered them in our co-working space in the center of Madrid – Jerónimo. Javi, Majida, Shay, Macarena, Alexander, Sophie and the architects team – thank you so much for all your help, you are the best!!! ? We had an intense workshop to understand better our current and future members and how to create the best experience for them to work, live and have fun. Bridging the gap between living and working communities has been a big part of why we started Urban Campus. We were happy to see that the participants see their future lifestyle in a similar way as we do. We were even happier to see them challenge some of our hypothesis and brainstorm new ideas with us! Even though the workshop was centered around co-living, the work-life balance has constantly came into the debate. Aside from having a place to live and relax, our participants are looking for environment where they can focus, be productive, advance in their personal and professional projects as well as express their creativity and relax after hours – we’ve got you covered! At Urban Campus, our core mission is bringing people together. Having participants with all different backgrounds in the room (countries, jobs, ages, interests, passions…) allowed us to make sure every voice is heard. We were impressed by the energy and creativity of all of you, both when designing private and common spaces in our co-living: maker workshops and music studios just to name a few. A well-furnished studio or a room, quality service, decorated with a heart…each of these points are important parts of co-living experience for our members. But beyond the material aspect, it’s the culture and community that participants truly value: meeting new people from all walks of life, learning from their experiences, living with others who share the same values (respect, share and caring). We are making extra effort to make sure we incorporate what matters to our members in the design of our next co-living space and the future projects. Why do good times pass by so quickly? 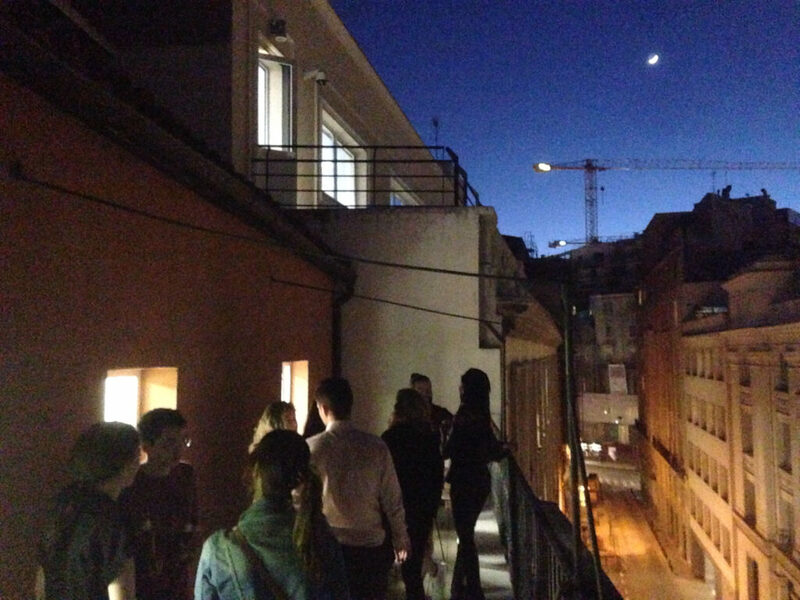 The evening extended around food and drinks on the terrace of Jerónimo. More than a workshop full of valuable insights from our current and future members, this evening was the opportunity for us to meet people inspired by the same values that those that drive our team. We can’t get enough! We can’t wait to start having you in our co-living space, be it for a visit or for a longer stay. We are already planning our next community workshops and think of ways to empower the most active members of our community. If you are interested in joining our co-living in Madrid, don’t forget to apply to join before June 15th!